9.45 a.m.: Saint Mary’s Church Askeaton, Co Limerick, the Parish Eucharist. Readings: Ezekiel: 37: 1-14; Psalm 130; Romans 8: 6-11; John 11: 1-45. In the name of + the Father, and of the Son, and of the Holy Spirit. 3, Lazarus himself is an interesting dramatis persona. He is often confused with the Lazarus in Saint Luke’s Gospel, the poor man at the gate, who is the only character to be named in any of the parables. But he has also given his name to hospitals and isolation units. He has inspired a corpus of mediaeval songs and poetry. More recently, he inspired Paul Spicer’s great modern composition, Come out, Lazar, commissioned by Bishop Tom Wright when he was the Dean of Lichfield Cathedral. It is difficult to consider any Gospel story without bringing to it a whole repository of cultural baggage. But the first readers of this story in the Early Church also had their expectations, built up slowly but thoughtfully, with care and with dramatic intent. The name Lazarus means ‘God helps,’ the Greek Λάζαρος (Lazaros) being derived from the Hebrew Eleazar, ‘God’s assistance,’ or: ‘God has helped.’ So, already the name of the principal character in this story introduces us to expectations of God’s actions, God’s deliverance. Jesus tarries. He waits four days – like the children of Israel wait 40 years in the wilderness before reaching the climax of their liberation. But then this is an Exodus story. Lazarus is called forth with the word: Exo (ἔξω), and he goes out (ἐξῆλθεν, exelthen, verse 44). Exodus leads to true liberation, to the fulfilment of God’s promise. And so, when Christ commands the onlookers to ‘let him go!’ (verse 44), it has the same force as Moses telling Pharaoh: ‘Let my people go!’ (see Exodus 9: 1, &c). Jesus tarries. He waits four days – like the 40 days he spent in the wilderness. He resists the temptation to be merely a miracle worker, to put on a show, to convince by sleight of hand. But when Christ calls for the rock to be rolled back, like the rock that is struck in the wilderness, new life comes forth. 1, What is unique about this story? 2, Why do we have this story at this time in Lent? 3, What does it say about Christ, and his call to us? 1, So, what is unique about this story? This story is not in the other three Gospels. In the Gospel according to Saint John, the raising of Lazarus from the dead is the last – and the greatest – of the seven Signs performed by Christ. This seventh Sign is the crowning miracle or Sign in Saint John’s Gospel, what John Marsh calls the crux interpretationis of the whole Gospel, for it reveals Christ as the giver of life, holding together his two natures, his humanity and his divinity. And this reading also contains the fifth of Christ’s ‘I AM’ sayings in this Gospel: ‘I am the resurrection and the life. Those who believe in me, even though they die, will live’ (John 11: 25). 2, Then, why do we have this story at this time in Lent? Today, the Fifth Sunday in Lent, is known in traditional Anglican calendars as Passion Sunday and marks the beginning of Passiontide, the final two weeks in Lent. Next Saturday – the Saturday before Palm Sunday – is known in the Orthodox Church as Lazarus Saturday, with Lazarus Saturday and Palm Sunday marked as days of joy and triumph between the penitence of Great Lent and the mourning of Holy Week, but looking forward to Christ’s resurrection on Easter Day. This Sign is the Sign that precipitates the death of Jesus, for this is the Sign that convinces the religious leaders in Jerusalem that they must get rid of Jesus. 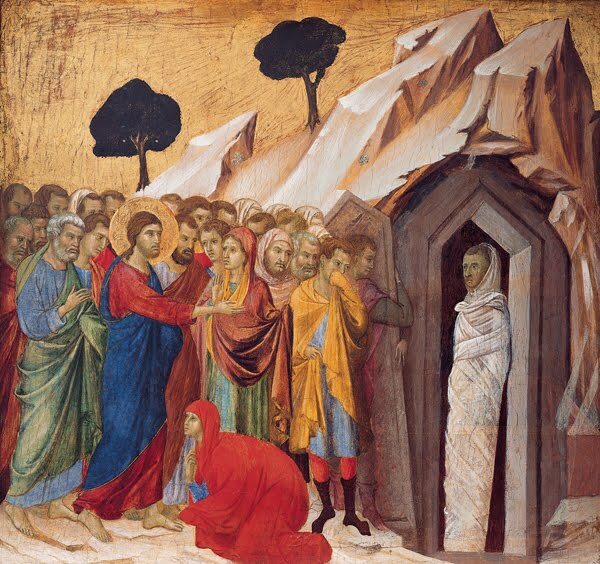 And so, the raising of Lazarus from the dead by Christ is an appropriate Sign to recall as a prelude to Holy Week, as a prelude to our preparations for the climax of Lent and to mark the death and resurrection of Christ. This seventh Sign holds together the two natures of Christ, his humanity and his divinity. It shows his humanity as he weeps at the death of his friend and asks: ‘Where have you laid him?’ (verse 35). Jesus loved Lazarus, who had died in Bethany. When he is told of his death, his response is enigmatic (verse 4). But the tenderness he shows counters any possibility of a harsh interpretation of that reply – Jesus loves … he loves Mary, he loves Martha, he loves Lazarus … he loves you, he loves me. And we have a revelation of Christ’s divinity. In him we see the love of God, the tender love of God. And he alone can command Lazarus to come forth from the dead (verse 43). Humanity and divinity. The death, burial and shroud of Lazarus represent our own sinful state. And the raising of Lazarus is a foreshadowing of the Resurrection of Christ and of the General Resurrection. Here too we engage with two recurring Johannine themes. There is the contrast between light and dark, a theme in recent weeks, as in the stories about Nicodemus and the blind man healed at the pool of Siloam. And there is the contrast between seeing and believing. Think of Thomas’s apparent faith at this point, how it turns to folly, anticipating the drama in Bethany but not yet having seen for himself that Lazarus is dead (verse 16). And compare this with his refusal later to believe that Christ is risen from the dead until he sees for himself after the Resurrection (John 20: 24-25). Or compare Thomas’s reluctant faith after the Resurrection, with Martha’s trusting faith after the death of her brother. Martha addresses Christ twice as ‘Lord’ (verses 21, 27). But she then uses three distinct titles in affirming her faith in Christ. Her confession of faith before Lazarus is raised from the dead is an unconditional faith: ‘Yes, Lord, I believe that you are the Messiah, the Son of God, the one coming into the world’ (verse 27). It is like Mary’s ecstatic confession to the disciples after meeting the Risen Christ in the Garden on Easter morning: ‘I have seen the Lord’ (John 20: 18). It is the promise at the very end of the Book of Revelation: ‘Surely I am coming.’ Amen. Come Lord Jesus (Revelation 22: 20). When Martha then speaks of Christ as the Teacher (verse 28), she is using the same title Mary uses when she speaks to him on Easter morning, ‘Rabbouni! … Teacher’ (John 20: 16). When Jesus asks: ‘Where have you laid him?’ (verse 34), he uses the same phrase used by the women at the empty tomb on Easter morning (John 20: 2), the same phrase Mary uses when she approaches Jesus in the garden (John 20: 13). Martha’s free confession, her unconditional faith, her passion, are so unlike Thomas’s confession of faith, which only comes after he gets to see what he demands, even if eventually he confesses: ‘My Lord and my God’ (John 20: 28). Martha moves beyond personal interest in seeking for her brother; now she moves beyond even that wider but limited circle of want and need to accepting God’s will. Do we believe because God answers our shopping-list requests for favours? Or do we believe because of the totality of God’s liberating acts, God’s loving acts, God’s faithful acts for us? Do we set conditions and terms for our belief, our faith, our commitment? Death was not the end for Lazarus … this time around. There is no further mention of him in the Bible. His first tomb in Bethany remains empty. According to tradition, he was 30 years old when he was raised from the dead. But, of course, he had to die a second (and final) time. And, at that death, it is said, Lazarus was buried in Larnaka in Cyprus. Death comes to us all. We all end in the grave. No miracles, no wishing, no praying, can avoid that inevitability. So what was wrong with the fact that Lazarus had died? That he was too young? We will all find when death comes that we are too young. Perhaps what the Gospel writer is saying here, in a deep and profound way, is that death without the comfort of knowing the presence of Christ is distressing for anyone who seeks to be a follower of Christ. In the Litany, which is used less-and-less frequently in the Church of Ireland, we are invited to pray: ‘from dying unprepared, save us, good Lord’ (The Book of Common Prayer, p. 175). For we know that death is not the end. In his death, Christ breaks through the barriers of time and space, bringing life to those who are dead. Those who hear the voice of Christ live. When Christ looks up and says: ‘Father, I thank you for having heard me,’ the Greek conveys more of the prayerful action that is taking place: And Jesus lifted up his eyes and said, ‘Πάτερ, εὐχαριστῶ σοι’ (Páter, efcharisto soi, ‘Father, I am giving thanks to you’). Lifting up his eyes is a prayerful action in itself, and combined with his giving thanks to the Father has actions and words that convey Eucharistic resonances. Comfort for the living, comfort for the dying and comfort for those who mourn. In our Eucharist this morning, we remember not just Christ’s passion and death, but also his Resurrection, and we look for his coming again. Christ in his life points us to what it is to be truly human. In the grave, he proves he is truly human. He has died. He is dead. Yet, unlike Lazarus the beggar, he can bridge the gap between earth and heaven, even between hell and heaven. But, like Lazarus of Bethany, he too is raised from death not by human power but by the power of God. ‘But you know, death is not the worst thing that could happen to a Christian.’ We know this with confidence because of the death and resurrection of Christ. Death is not the end. Of the petral and the porpoise. In my end is my beginning. Let us give thanks to God for life, for death, and for the coming fulfilment of Christ’s promises, which is the hope of the Resurrection, our Easter faith. ‘Surely I am coming.’ Amen. Come Lord Jesus (Revelation 22: 20). 7 ἔπειτα μετὰ τοῦτο λέγει τοῖς μαθηταῖς, Ἄγωμεν εἰς τὴν Ἰουδαίαν πάλιν. 8 λέγουσιν αὐτῷ οἱ μαθηταί, Ῥαββί, νῦν ἐζήτουν σε λιθάσαι οἱ Ἰουδαῖοι, καὶ πάλιν ὑπάγεις ἐκεῖ; 9 ἀπεκρίθη Ἰησοῦς, Οὐχὶ δώδεκα ὧραί εἰσιν τῆς ἡμέρας; ἐάν τις περιπατῇ ἐν τῇ ἡμέρᾳ, οὐ προσκόπτει, ὅτι τὸ φῶς τοῦ κόσμου τούτου βλέπει: 10 ἐὰν δέ τις περιπατῇ ἐν τῇ νυκτί, προσκόπτει, ὅτι τὸ φῶς οὐκ ἔστιν ἐν αὐτῷ.11 ταῦτα εἶπεν, καὶ μετὰ τοῦτο λέγει αὐτοῖς, Λάζαρος ὁ φίλος ἡμῶν κεκοίμηται, ἀλλὰ πορεύομαι ἵνα ἐξυπνίσω αὐτόν. 12 εἶπαν οὖν οἱ μαθηταὶ αὐτῷ, Κύριε, εἰ κεκοίμηται σωθήσεται. 13 εἰρήκει δὲ ὁ Ἰησοῦς περὶ τοῦ θανάτου αὐτοῦ. ἐκεῖνοι δὲ ἔδοξαν ὅτι περὶ τῆς κοιμήσεως τοῦ ὕπνου λέγει. 14 τότε οὖν εἶπεν αὐτοῖς ὁ Ἰησοῦς παρρησίᾳ, Λάζαρος ἀπέθανεν, 15 καὶ χαίρω δι' ὑμᾶς, ἵνα πιστεύσητε, ὅτι οὐκ ἤμην ἐκεῖ: ἀλλὰ ἄγωμεν πρὸς αὐτόν. 16 εἶπεν οὖν Θωμᾶς ὁ λεγόμενος Δίδυμος τοῖς συμμαθηταῖς, Ἄγωμεν καὶ ἡμεῖς ἵνα ἀποθάνωμεν μετ' αὐτοῦ. 17 Ἐλθὼν οὖν ὁ Ἰησοῦς εὗρεν αὐτὸν τέσσαρας ἤδη ἡμέρας ἔχοντα ἐν τῷ μνημείῳ.18 ἦν δὲ ἡ Βηθανία ἐγγὺς τῶν Ἱεροσολύμων ὡς ἀπὸ σταδίων δεκαπέντε. 19 πολλοὶ δὲ ἐκ τῶν Ἰουδαίων ἐληλύθεισαν πρὸς τὴν Μάρθαν καὶ Μαριὰμ ἵνα παραμυθήσωνται αὐτὰς περὶ τοῦ ἀδελφοῦ. 20 ἡ οὖν Μάρθα ὡς ἤκουσεν ὅτι Ἰησοῦς ἔρχεται ὑπήντησεν αὐτῷ: Μαριὰμ δὲ ἐν τῷ οἴκῳ ἐκαθέζετο. 21 εἶπεν οὖν ἡ Μάρθα πρὸς τὸν Ἰησοῦν, Κύριε, εἰ ἦς ὧδε οὐκ ἂν ἀπέθανεν ὁ ἀδελφός μου: 22 [ἀλλὰ] καὶ νῦν οἶδα ὅτι ὅσαἂν αἰτήσῃ τὸν θεὸν δώσει σοι ὁ θεός. 23 λέγει αὐτῇ ὁ Ἰησοῦς, Ἀναστήσεται ὁ ἀδελφός σου. 24 λέγει αὐτῷ ἡ Μάρθα, Οἶδα ὅτι ἀναστήσεται ἐν τῇ ἀναστάσει ἐν τῇ ἐσχάτῃ ἡμέρᾳ. 25 εἶπεν αὐτῇ ὁ Ἰησοῦς, Ἐγώ εἰμι ἡ ἀνάστασις καὶ ἡ ζωή: ὁ πιστεύων εἰς ἐμὲ κἂν ἀποθάνῃ ζήσεται, 26 καὶ πᾶς ὁ ζῶν καὶ πιστεύων εἰς ἐμὲ οὐ μὴ ἀποθάνῃ εἰς τὸν αἰῶνα: πιστεύεις τοῦτο; 27 λέγει αὐτῷ, Ναί κύριε: ἐγὼ πεπίστευκα ὅτι σὺ εἶ ὁ Χριστὸς ὁ υἱὸς τοῦ θεοῦ ὁ εἰς τὸν κόσμον ἐρχόμενος. 38 Ἰησοῦς οὖν πάλιν ἐμβριμώμενος ἐν ἑαυτῷ ἔρχεται εἰς τὸ μνημεῖον: ἦν δὲ σπήλαιον, καὶ λίθος ἐπέκειτο ἐπ' αὐτῷ. 39 λέγει ὁ Ἰησοῦς, Ἄρατε τὸν λίθον. λέγει αὐτῷ ἡ ἀδελφὴ τοῦ τετελευτηκότος Μάρθα, Κύριε, ἤδη ὄζει, τεταρταῖος γάρ ἐστιν. 40 λέγει αὐτῇ ὁ Ἰησοῦς, Οὐκ εἶπόν σοι ὅτι ἐὰν πιστεύσῃς ὄψῃ τὴν δόξαν τοῦ θεοῦ; 41 ἦραν οὖν τὸν λίθον. ὁ δὲ Ἰησοῦς ἦρεν τοὺς ὀφθαλμοὺς ἄνω καὶ εἶπεν, Πάτερ, εὐχαριστῶ σοι ὅτι ἤκουσάς μου. 42 ἐγὼ δὲ ᾔδειν ὅτι πάντοτέ μου ἀκούεις: ἀλλὰ διὰ τὸν ὄχλον τὸν περιεστῶτα εἶπον, ἵνα πιστεύσωσιν ὅτι σύ με ἀπέστειλας. 43 καὶ ταῦτα εἰπὼν φωνῇ μεγάλῃ ἐκραύγασεν, Λάζαρε, δεῦρο ἔξω. 44 ἐξῆλθεν ὁ τεθνηκὼς δεδεμένος τοὺς πόδας καὶ τὰς χεῖρας κειρίαις, καὶ ἡ ὄψις αὐτοῦ σουδαρίῳ περιεδέδετο. λέγει αὐτοῖς ὁ Ἰησοῦς, Λύσατε αὐτὸν καὶ ἄφετε αὐτὸν ὑπάγειν. 45 Πολλοὶ οὖν ἐκ τῶν Ἰουδαίων, οἱ ἐλθόντες πρὸς τὴν Μαριὰμ καὶ θεασάμενοι ἃ ἐποίησεν, ἐπίστευσαν εἰς αὐτόν. 1 Now a certain man was ill, Lazarus of Bethany, the village of Mary and her sister Martha. 2 Mary was the one who anointed the Lord with perfume and wiped his feet with her hair; her brother Lazarus was ill. 3 So the sisters sent a message to Jesus, ‘Lord, he whom you love is ill.’ 4 But when Jesus heard it, he said, ‘This illness does not lead to death; rather it is for God’s glory, so that the Son of God may be glorified through it.’ 5 Accordingly, though Jesus loved Martha and her sister and Lazarus, 6 after having heard that Lazarus was ill, he stayed two days longer in the place where he was. (Revd Canon Professor) Patrick Comerford is Priest-in-Charge, the Rathkeale and Kilnaughtin Group of Parishes. This sermon was prepared for Sunday 2 April 2017.